It is such a treat to listen as Yang was echoing Nathan’s words. Nathan kept giving her new words to echo and smiled and laughed as Yang echoed it back exactly the way he wanted! From the outside it may seem like non-sense string words put together, but if you think about it, Yang successfully encouraged Nathan to stay with her in a very long “conversation” that he enjoys, be it in the autism language. This enjoyment of “talking” with another person is the foundation of future engaging conversations that Nathan will be capable of holding. It starts with being happy to engage with people! 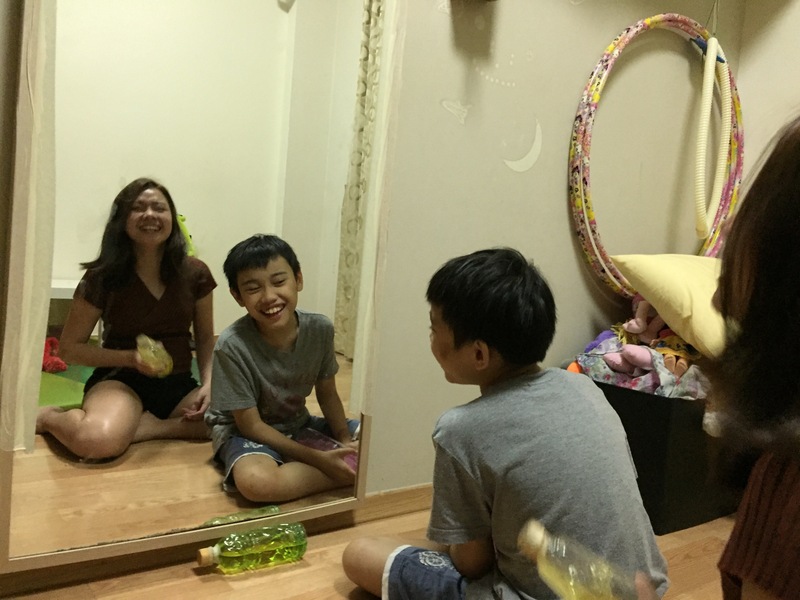 In the photo: Yang and Nathan having their conversation with strong eye-contact through the mirror.